This is the fall-themed doll quilt I made for the Four Seasons Doll Quilt Swap. I swear that all the evil anti-quilt forces in the universe had converged upon my house to prevent it from being finished and mailed! First I couldn’t decide on a design. I had the idea of one or more red maple leaves appliqueed on blue or green. I bought some fat quarters but decided they didn’t really look good together. This was fortunate because another participant with the same idea posted something much better than what I had in mind. Finally I decided on chinese coins because I like the geometric look of such quilts. So the cutting and piecing began and some very wonky strips emerged. After much ripping, redoing and rotary cutting I got them to look decently straight. But when I lined them up the coins didn’t line up horizontally. Part of the problem is that the green background fabric was thinner and squirmier than the bright batiks that make up the coins. The other part is that my quilting education comes primarily from TV and the internet, I don’t really know what I am doing and obviously need a quarter inch foot or some other kind of intervention. Hoping that my recipient (whose quilts have won awards :o) is not a perfectionist I pressed on. The deadline was looming but I had blocked off three mornings to get this job done. That’s when we all got sick. Gwen had a sinus infection, I had bronchitis and even Gwensdad was sniffling and snorting. All of Gwen’s caregivers got sick too. In one four day stretch, we only had help on ONE of the nights. (For those who don’t know, my daughter Gwen is handicapped and needs 24 hour supervision.) So add a heaping dose of sleep deprivation to the mix. The deadline passed but I persevered, working here and there, popping antibiotics, guzzling many gallons of fluid and sucking down two dozen popsicles to sooth a burning throat. I ran out of green fabric and had to go out for more. My rotary cutter blade became too dull to use and the store was out of the right size replacements. Then my sewing machine began to cry out for maintenance. It communicates this by varying the stitch length according to the speed with which I sew. Needless to say the first line of quilting I did looked like a disaster! The solution was so sew v-e-r-y s-l-o-w-l-y to keep the stitch length long enough and somewhat uniform. Although I executed a perfect continuous binding on my last doll quilt, I couldn’t get it right on this one and had to use another method. The saving grace was a weekend silent retreat I attended. It afforded the silence and space I needed to get a muster a second wind and get it done. I added some extra goodies to the package make up for such tardiness and was thrilled to get the message that it has arrived in New Zealand and that the recipient likes it. Or that she is kind and merciful enough to say that she does! 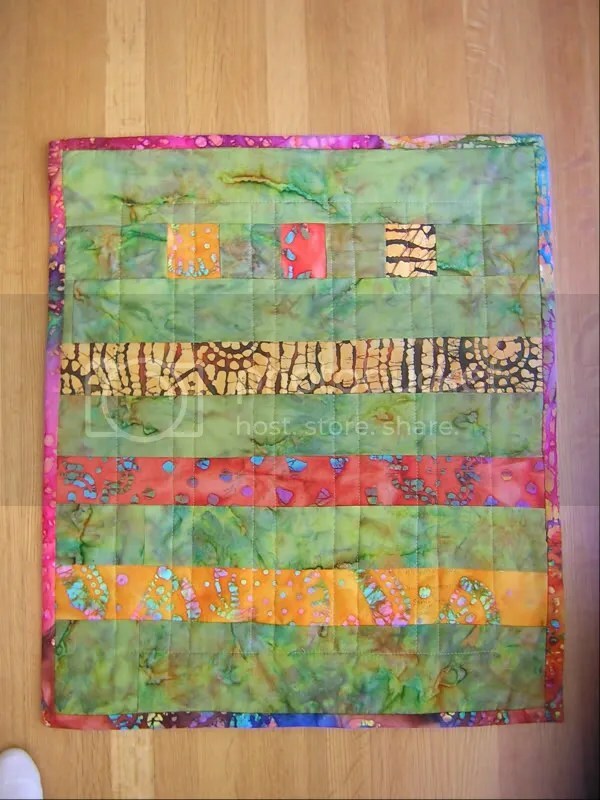 Even though the making of this quilt was strewn with pitfalls and near-disasters I still managed to enjoy it because the colors of the fabrics are just gorgeous! In retrospect, I should have used a lighter green for the background and/or spaced the coins farther apart. But it still turned out fairly well and the forces of evil are defeated. This entry was posted on October 16, 2007 at 6:37 pm and is filed under Uncategorized. You can follow any responses to this entry through the RSS 2.0 feed. You can leave a response, or trackback from your own site.